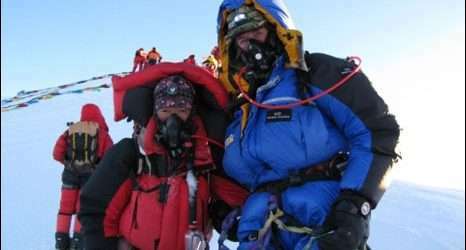 I salute the first British pensioner to reach the summit of Everest. You need a strong constitution if you’re going to do anything alongside him, as I found out a few years ago. We hired Sir Ranulph Fiennes to open a conference we organised in Edinburgh when I was with Hyperion. As he began speaking, I was standing in the wings wearing a headset intercom, organising what came before and what would follow. Through another headset, I could hear the stream of simultaneous translation from the translators booths at the back of the auditorium. In the audience that morning were finance people from perhaps twenty countries, waiting to be inspired. Within the first thirty seconds, Sir Ranulph had said something provocative about almost all the stereotypical views of the peoples of other lands. I could hear the translators struggling to find a way of conveying his remarks. There was hardly anyone in the hall who wouldn’t have felt justifiably insulted. I looked across the stage, behind the speaker, at my second-in-command. What I could see of her face was ashen-white; she had her hand over her eyes. I started thinking fast about how to go on after him and smooth down several hundred important customers. In the next minute or so, it became clear that Sir Ranulph had been ‘getting everyone’s attention’, and ‘breaking the ice’. He continued with tales of his exploits, linked them to leadership in business, and paid tribute to people from around the world that he had met and respected. He departed the stage to loud applause. I hope your journey back from the summit is a safe one, Sir Ranulph. Matthew’s strategic thinking and analytical approach helped us lay down the necessary foundations required to build a successful company.